Hey boys and girls! I know you'll all be shocked to learn that I bought a bunch of comics this week. Now I'm going to tell you about 5 of them! Isn't that odd? Batman #25 - "Shhhh...Just embrace it." 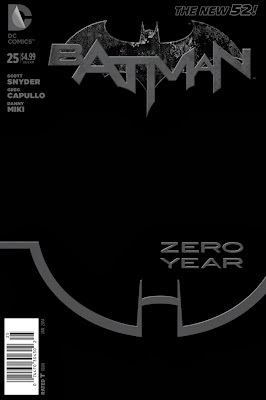 The giant ongoing "Zero Year" New 52 Batman origin story continues here and the debutant Dark Knight has a disturbing mystery to solve. Someone or something in Gotham City is murdering people in a grotesque fashion...forcing their bones to grow and expand erratically and unstoppably, turning men into disturbing tree-like corpses! Meanwhile a young Lieutenant Gordon has his own mystery to solve...who or what is the Bat-Man?? Also, WHERE does he get his wonderful toys? All of this is going on in the foreground while the whole of Gotham is plunged into chaos when the Riddler manages to shut off the power to the entire city on the eve of what promises to be one of the worst super-storms of the decade! Oh and I forgot to mention...the debut of the very first New 52 BATMOBILE! It's too early to say for sure since "Zero Year" is supposed to last 11 issues (not counting the current crop of tie-ins) but so far, it's shaping up to easily be my favourite Batman story told in the New 52! Great work by everyone involved and each issue makes me want the next one that much more! OF course that's not all...4 more comics after the JUMP! 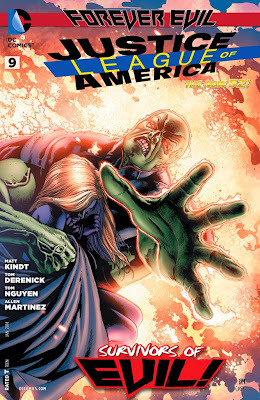 Justice League of America #9 - "I totally just saw Wonder Woman. She is freaking tall!" 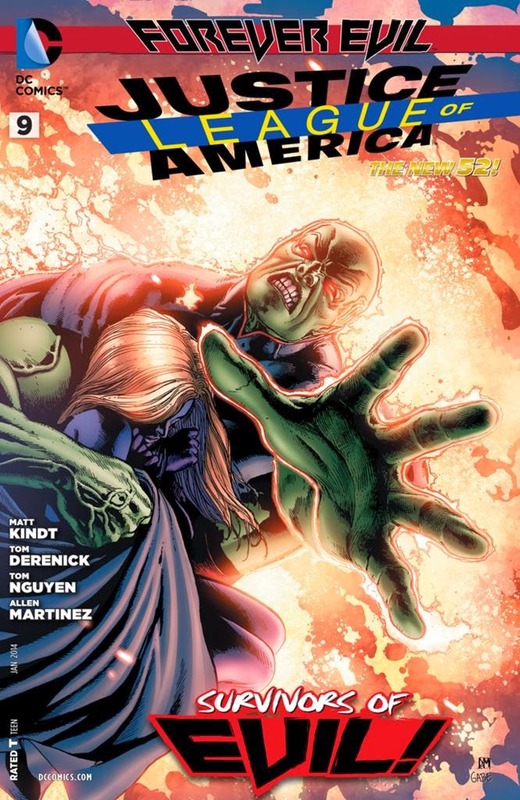 Stargirl and Martian Manhunter have quickly become two of my favourite characters in the DCU...mainly because the two of them have been showcased and developed nicely over the past few months in Justice League of America! 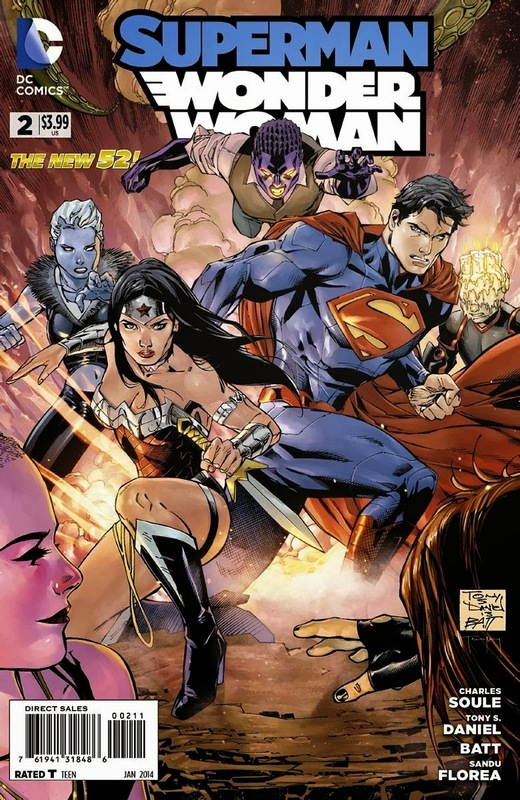 That trend continues in this "Forever Evil" tie-in, as we rejoin our heroes still trapped in a strange "prison-of-the-mind" thing along with several members of the various Justice Leagues...all of whom appear to be just a few waves short of a shipwreck. The prison the heroes are trapped in is bringing out the worst in them...fighting them with aspects of their own personalities and beating them! Except for Stargirl! She's a little too young and optimistic to get trapped into a bunch of foolish mind games! What a great expanded role for the youngest League member this month...we learn a lot more about her background, origin and attitude in general! She even gets her own flashbacks! I really hope that both she and the Manhunter continue to get time in the spotlight long after "Forever Evil" is wrapped up. They're two great characters and they both deserve it! Forever Evil: Arkham War #2 (of 6) - "Word of advice, Pierce--when the world's ending...put the bitching on pause." Arkham War really steps it's game up here in issue #2! Mostly due to a meeting between Bane and the Penguin that really highlights both characters...more than highlights...Elevates! The various factions of mobsters, ruffians and the criminally insane that have taken over Gotham City in the wake of the Crime Syndicate's attack better look out if they think they've got control...it seems pretty clear to me that any sense of order is tenuous at best! It's all one big crazy game of chance with a whole lot of wild cards...not the least of which are Man-Bat, Scarecrow and even...Commisioner Jim Gordon! 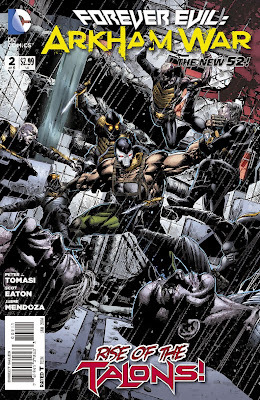 I'll admit that I felt pretty neutral about the first issue of this "Forever Evil" tie-in, but that's all changed! The level of scheming and plots-within-plots that were introduced this issue really intrigues me! What will happen next? I honestly have no idea, but I'm anxious to find out! Worlds' Finest #17 - "Like you're so pure?" Anyway I just really liked this issue...the artwork popped more than usual, the plot, characters and dialogue all seemed more "on" than usual...of maybe I just really like seeing Huntress use her detective and tracking skills...you know...go on the "hunt"! Whatever the case, great issue! Superman/Wonder Woman #2 - "I've never been hit that hard, Clark." Speaking of "present day"...Superman and Wonder Woman have a BIG problem! While they were out trying to save some sailors from a stormy sea, they encountered something that SHOULD be trapped in the Phantom Zone. That something? DOOMSDAY. The monster that killed Superman (at least in ONE reality) managed to briefly escape the Phantom Zone somehow and actually attack and cause damage before flickering back into the prison dimension. This means that the Phantom Zone is...weakening? Not entirely inescapable? We don't really know what it means, but Diana and Clark better find out, and fast! Wonder Woman has a pretty good idea...get help from her brother Hephaestus, the Greek god of blacksmiths, craftsmen, etc...aka the god who BUILDS stuff! Assuming he's willing to help a lowly mortal like Superman! ANNNNDDDDD that's our show...er...article!! As always, you mustn't forget to visit your Local Comic Book Shop tomorrow for NEW comics! New issues of Wonder Woman, Forever Evil: Rogues Rebellion, Supergirl, and more are being released! Also the debut of a new Harley Quinn ongoing!! Nice! If you've got some time I managed to tear myself away from Arkham Origins for a few minutes in order to write a post for Stryder's Dementia. Take a look...if nothing else there's a cool pic of Batman and Superman you can steal! Have a great week! Peace!